War with Russia, China, and India, or Global Development Partnership? A PDF version of this article appears in the April 29, 2016 issue of Executive Intelligence Review and is re-published here with permission. April 22—In the absence of adequate public debate on a development that concerns all of our lives and on which the future existence of the human race depends, the world once again finds itself in a Cold War and a global spiraling arms race: The United States’ and NATO’s attempt to ram through a unipolar world order—although it does not correspond to actual power relations—threatens to set off new wars. In the age of thermonuclear weapons, it would mean the third and final world war. 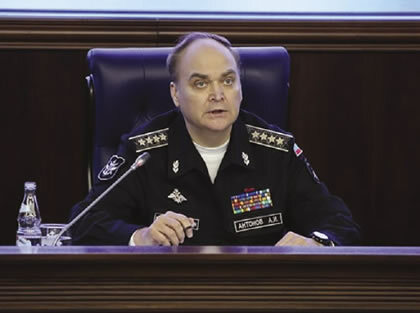 The simultaneous flare-up of the conflicts in the South China Sea and around the Korean Peninsula, and the situations in the Baltic states and Baltic Sea, in Ukraine, and Southwest Asia are all defined, despite their own specific predicates, by this characteristic: In stark contrast to the official propaganda line which accuses Russia and China of aggressive behavior, it is in reality the United States, Great Britain, and NATO that are working away at encircling and provoking Russia and China. To this end, President Obama launched last week the Southeast Asia Maritime Security Initiative, funded with $425 million, an initiative intended to forge the seven ASEAN nations, plus Taiwan, into a military bloc against China in the Pacific. In an article titled, “Saving the South China Sea Without Starting World War III,” published March 30 in The National Interest, the author, Van Jackson, a military analyst from the Center for a New American Security, even urged the creation of an alliance which would bring India, Australia, South Korea, Japan, Indonesia, Vietnam, and the Philippines together under U.S. direction. The foreign ministers of China, Russia, and India met in Moscow on April 19. 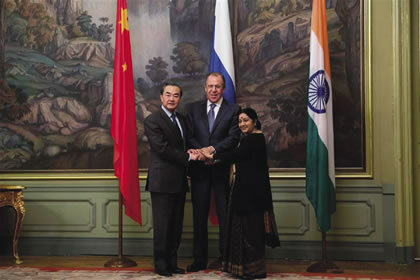 From left, Wang Yi, Sergey Lavrov, and Sushma Swaraj. Chinese international affairs expert Hua Yisheng responded in an uncharacteristically sharp tone in the official Chinese newspaper People’s Daily, in an article with the headline, “U.S. Fanning the Flames of Potential World War III Will Only Hurt Itself.” He described the massive military buildup in the region against China that is already underway, and the picture of Chinese activities there which has been distorted for the sake of propaganda. Given the obvious orchestration of an escalation of the situation in the South China Sea prior to the ruling on the Philippines’ complaint against China before the Permanent Court of Arbitration in the Hague—a ruling expected in late May or early June—Chinese Foreign Minister Wang Yi declared explicitly that, in denying the authority of this court, China is in absolute accordance with Article 298 of the UN Convention on the Law of the Sea (UNCLOS), which excludes any forced settlement and provides instead for solutions to conflict through dialogue and negotiation. The same guideline appears in Article 4 of the Declaration on the Conduct of Parties in the South China Sea (DOC), which has been signed by China and the ASEAN nations. It is rather the Philippines that is aggravating the situation with its one-sided claims. At the latest meeting of the Russian, Chinese, and Indian foreign ministers in Moscow, Russian Foreign Minister Sergey Lavrov explicitly supported the Chinese position that the conflict should be solved through negotiations between the nations directly affected, and by avoiding its internationalization. At the conclusion of this meeting, in what must have come as a surprise to some, all three foreign ministers signed a communiqué presenting the international treaties which China invokes—UNCLOS and DOC—as the correct basis for resolving the conflict. That makes clear that India has rejected the United States’ claim to a unipolar world. Moreover, the Chinese Foreign Ministry sharply condemned the statement by British Minister of State at the Foreign Office Hugo Swire, that Great Britain fully and totally supports the United States’ demand that the decision of the Permanent Court of Arbitration in the Hague be binding on both parties. The only new development, it said, is the more frequent deployment of American airplanes and frigates into the region. In a similar inversion of the facts, the United States presented the close encounter between the U.S. destroyer USS Donald Cook and a Russian fighter aircraft in the Baltic Sea, as “Russian aggression,” although the incident occurred only 70 sea miles from Russian territory, and the Baltic Sea is, like the South China Sea, many thousands of miles from the United States. You only have to convince people that black is white, and white is black, as Bertrand Russell remarked in his time. Meanwhile, nearly 15 years after the attacks of September 11, 2001, there is finally a groundswell for publishing the now famous 28-page chapter of the Joint Congressional Inquiry, which has been kept classified and, according to the then co-leader of this investigation, Senator Bob Graham, shed light on the leading role of Saudi Arabia in this terrorist attack, which changed the world so decisively. This coincided with President Obama’s trip to Riyadh, where he assured the Saudi regime and the leaders of the Gulf Cooperation Council that the United States (and NATO?) will defend these states against Iran. And so, as if there were no commotion over the 28 pages, Obama’s trip took him directly from visiting King Salman to Queen Elizabeth—without thought of the Al-Yamamah/BAE agreement of some 25 years ago between the two royal houses, which is suspected of being used to finance terrorist activities. Meanwhile in the United States, pressure is mounting on Obama as to why he continues to maintain the cover-up of the role of Saudi Arabia in the attacks of September 11, the coverup which George W. Bush openly organized. An insight into this question was afforded in the item Obama published on April 22 in the Daily Telegraph, in which he urges the British to vote to remain in the European Union in the upcoming referendum, because they “should be proud” that the EU helps to spread British values across the continent. The Mayor of London, Boris Johnson, immediately accused Obama of hypocrisy, since the United States has never signed on to the International Criminal Court, nor the UNCLOS, nor the UN Convention on the Rights of the Child, nor the UN Convention on the Emancipation of Women. Aside from the public relations version, what are these British values? Wars based on lies that trigger refugee flows to Europe; tax havens and the financing of illegal operations as in the scandal of the Panama Papers now coming to light (or should they be called the London Papers? ); laundering of drug money through banks such as HSBC; credit conditionalities that have for decades thrown the so-called Third World into abject poverty crashes—the list goes on and on. In light of the escalating confrontation with Russia and China—and thus implicitly also India—it is high time that Germany and other European nations reconsider what their real security interests are. The sanctions against Russia have inflicted significant losses on German industry, and were moreover based on a “narrative” of the Ukraine crisis, which is just as distorted as the story about the alleged Chinese aggression in the South China Sea, or the one about “our allies” Saudi Arabia and Turkey, who still support ISIS or ISIS-allied groups in Syria and Iraq. Russia has shown itself to be a reliable and indispensable partner in the case of the negotiations of the P5+1 agreement with Iran and in the military intervention into Syria. China, with its offer of win-win cooperation in the development of a new Silk Road, provides a convincing perspective for a global development partnership. We are on the verge of World War III, and the only chance for America to regain its identity as a republic is for Germany, and therefore Europe, to say no to global confrontation with Russia, China, and India. This article was written for the German newspaper, Neue Solidarität. 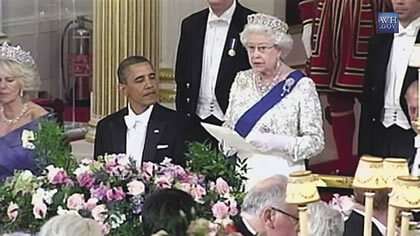 LaRouche or Obama? Development or War in Asia?